The Chicago Blackhawks have worn black third jerseys off an on since the late ‘90s. We’re currently in an off period but I’d love to see them come back at some point. And if they were inspired by this concept from Nick Burton, all the better! The 2019 NHL Winter Classic at Notre Dame started coming into clearer focus with the release of the team crests. Nick Burton employs those on a pair of great, throwback-inspired jerseys. 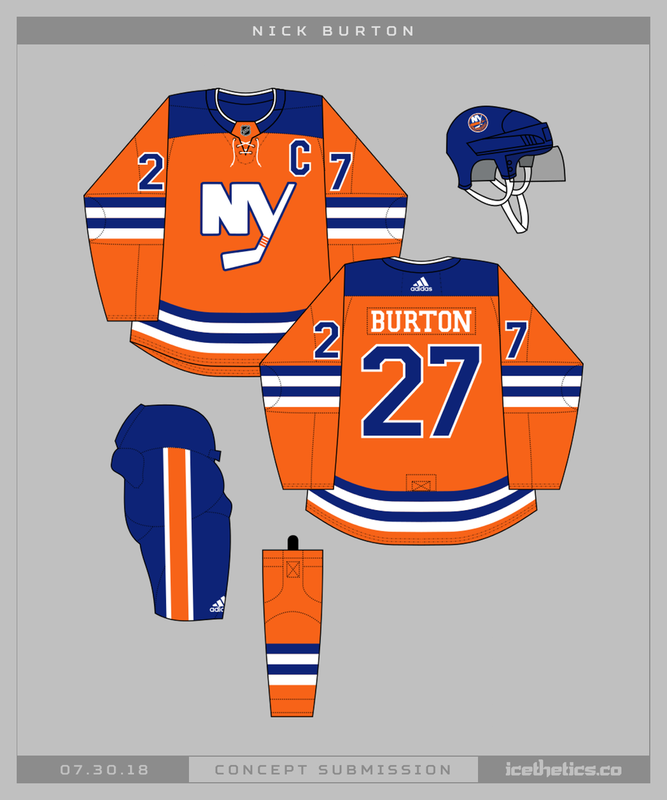 Nick Burton returns with his interpretation of our New York Islanders third jersey rumors. I'm all for seeing the Dallas Stars in green, but that doesn't mean they shouldn't try on a black third jersey now and then. Nick Burton has a great option here — though if it were me, I'd swap the crest and shoulder patch. With the help of Nick Burton, I'd like to coin a new jersey term today — the thirdback. It's a throwback third jersey. If the Edmonton Oilers ever wanted to go back to this alt from the '00s, we'd have to call it a thirdback. Jeez, what am I saying? No we wouldn't. That is beyond dumb. Forget I said any of this. Go on about your day as usual.